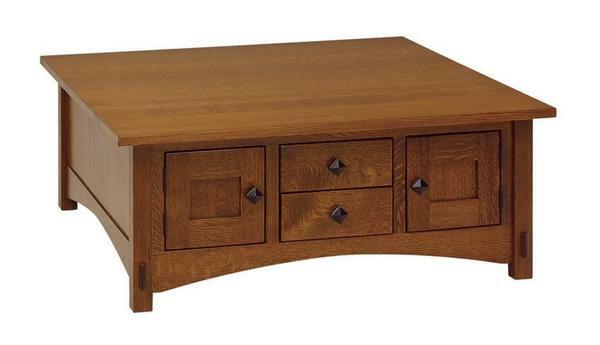 Our Amish Lucern Mission Deluxe Coffee Table will make a statement in the living room or office with its square design, solid wood construction, and mission-style details carefully crafted to make an impact. This square coffee table features a 1-inch thick top, exposed tenons on the legs, two soft-close drawers with maple drawer boxes, two doors with soft-close concealed hinges (not shown), and a gently arching base. Shown in quarter sawn white oak with Michael's cherry stain and #3 hardware, this occasional table can be made from your choice of wood type, finish, and hardware from a variety of options.